When we awaken to the call of beauty, we become aware of new ways of being in the world. We were created to be creators. At its deepest heart, creativity is meant to serve and evoke beauty. The time is now ripe for beauty to surprise and liberate us. Wishing you a year of beautiful surprises and liberation. This entry was posted in John O'Donohue and tagged beauty, John O'Donohue on December 31, 2014 by terryvatrt. May you experience some wonder and joy this holiday season….. This entry was posted in Henri Matisse, MoMA and tagged Christmas, Henri Matisse, MoMA, Nuit de Noël on December 24, 2014 by terryvatrt. 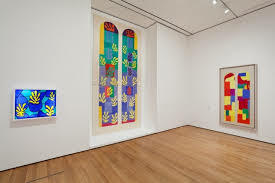 Another highlight of Henri Matisse: The Cut-Outs at MoMA was learning about Matisse’s work in the Chapel of the Rosary in Vence, France. 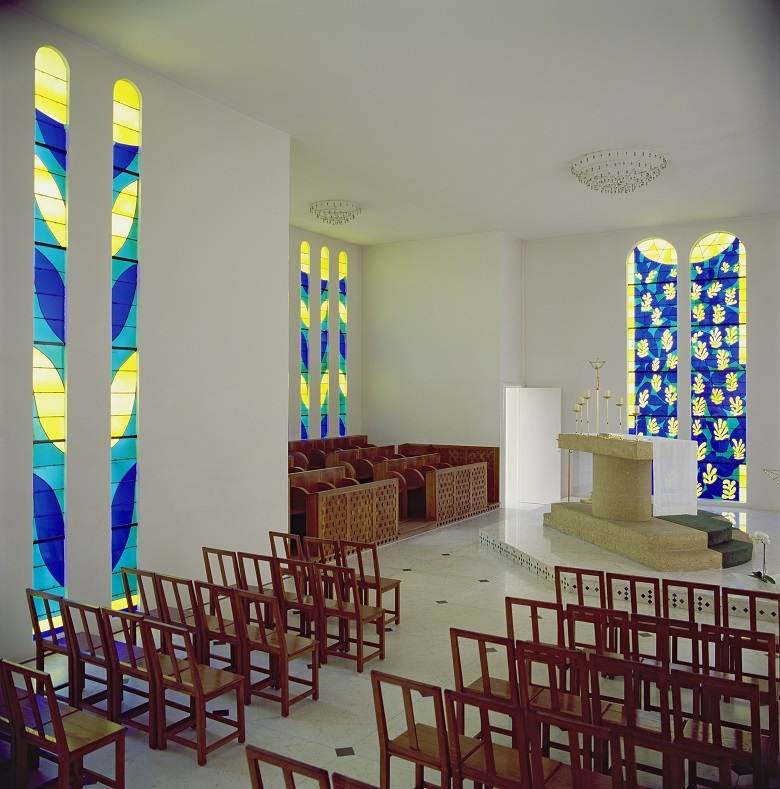 Matisse was originally hired to design the stained glass windows, but eventually went on to design the chapel (working with the architect Auguste Perret) and its contents, including the Stations of the Cross, the alter linens, the priests’ vestments and the furniture. I think The Art Caravan will be planning a trip to Vence. The show at MoMA brought me to tears. I felt surrounded by joy, passion, and love for art and life. 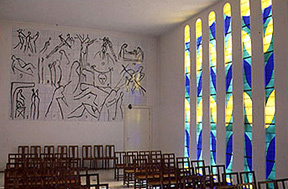 To see Matisse’s work in a permanent installation, The Chapel of the Rosary, must be a very affirming experience. 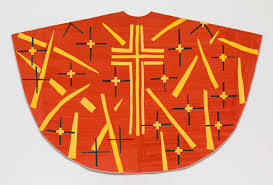 This entry was posted in Chapel of the Rosary, Frrance, Henri Matisse, MoMA, New York City, Sacred art and tagged Chapel of the Rosary, France, Henri Matisse, MoMA, New York City, Sacred art, stained glass windows, Vence, Vence France on December 15, 2014 by terryvatrt. 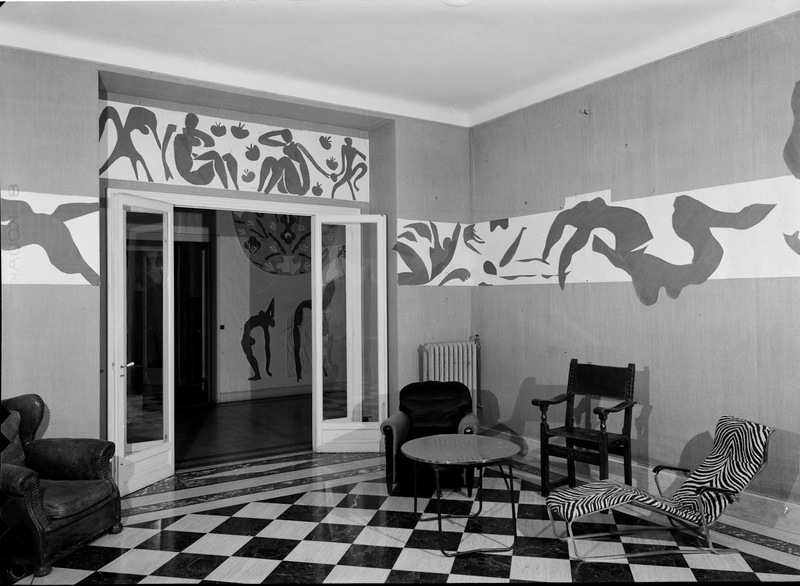 The impetus for Henri Matisse: The Cut-Outs at MoMA was the restoration of The Swimming Pool, (1952) Matisse’s only site specific cut out installation. MoMA acquired the work in 1975, and it hasn’t been on display in more than twenty years. The story behind The Swimming Pool goes something like this……One summer day in 1952, Matisse decided he wanted to go down to the local swimming pool to watch the divers. Not surprisingly, it being the south of France, he found it too warm, and returned to his home, intent on creating his own swimming pool. 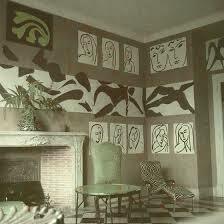 The dining room was chosen, and Matisse and his assistants went to work, making history. The restoration of the work began in 2008. It was an extensive project to return the paper colour to its original balance, and remove and replace the deteriorated burlap on which the paper cuts had been mounted. At times, the burlap was removed strand by strand. The result of all the time, money and care expended is a stunning reclamation of a charming work of art. Matisse: The Cut-Outs recreates The Swimming Pool in all its dining room-sized glory. This entry was posted in Art Installation, Henri Matisse, MoMA and tagged Henri Matisse, installation art, MoMA, The Swimming Pool on December 11, 2014 by terryvatrt. 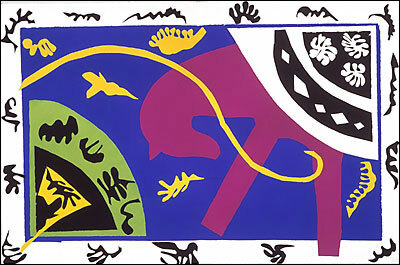 Joy spread through colour was Henri Matisse‘s definition of modern art. I can tell you that seeing Matisse: The Cut Outs Paper Cuts at MoMA was, indeed, a joyful experience. 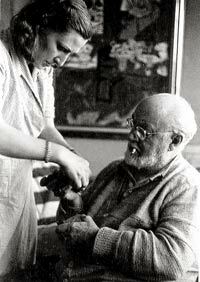 A decade or two ago, I saw a show of Matisse cut outs in Washington, D.C. The power of those pieces has stayed with me all these years. More recently, a favourite art professor often praises Matisse, claiming he is the foremost artist of the 20th century. MoMa collaborated with the Tate Modern to produce this extensive show. The work is displayed chronologically, which helps understand the development of paper cutting in Matisse’s art practise. As I understand it, the paper cuts weren’t originally intended to be the finished pieces of art. Matisse used cut out pieces of paper to plan designs (just like the aforementioned art professor advises his students.) After the printing of his book, Jazz, he was disappointed with the result. 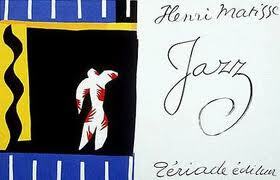 Despite Matisse’s reservations, Teriade persisted, and eventually, Jazz was published, to great success. 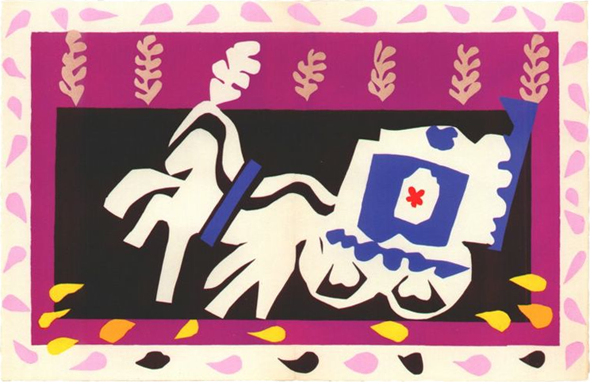 This entry was posted in collage, Modernism and tagged collage, Henri Matisse, Modernism, MoMA on December 3, 2014 by terryvatrt.